This is the main railway station in the City of Como and it is located in Piazzale San Gottardo, a short distance west of the city centre. In Italian, the stations is called Stazione di Como San Giovanni. This railways station is included in the Milan-Chiasso line and is also a terminus of the Como-Lecco line. The Como-Lecco line branches off the main line at Albate-Camerlata, a few kilometres to the south. On the line Milan-Chiasso, the Como San Giovanni station is the last one on the Italian side of the border to Switzerland, and is therefore considered a border station. In 2008, Switzerland joined the Schengen Agreement and the routine customs checks were abolished. 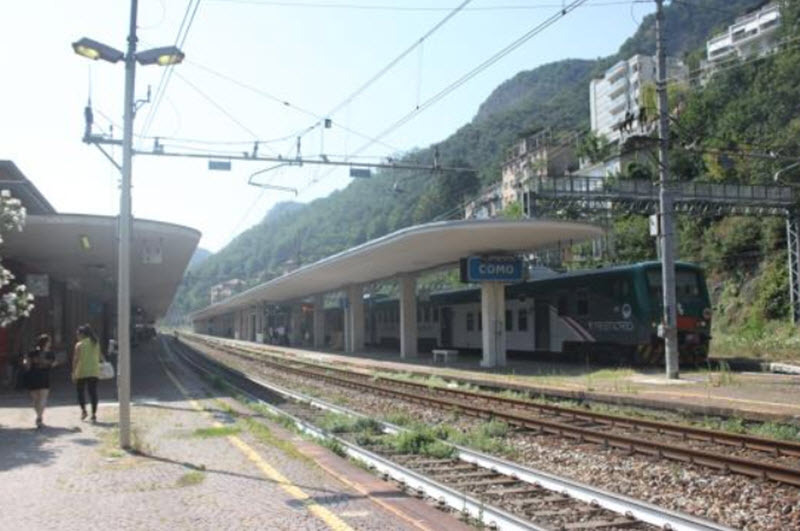 The Como San Giovanni railway station has about 1.5 million passenger movements per year. The railway station is managed by Rete Ferrovariaria Italiana (RFI), except for the commercial area of the passenger building which is managed by Centostazioni. Both are subsidiaries of the state-owned Ferrovie dello Stato (FS). The train services are operated by Trenitalia, which is also subsidiary of Ferrovie dello Stato (FS). The railway station building is a two-level brick building. Only the ground floor is open to the public, and it is comprised of three sections joined together by a glass wall. The station yard has five through tracks, but only four of them are used by passenger trains and track four is only very rarely used at all. Each of these four tracks have a platform covered by a concrete shelter. Track 4 Accessible via a small platform between tracks 3 and 4. You have to cross track 3 to get there. There are two dock platforms on the north side of the stations and three dock platforms on the southern side. The ones on the southern side are for the Lecco train line. There is also a track to the north serving the Como railway post office, and two tracks to the south connecting the station with the goods yard and the Customs Agency. 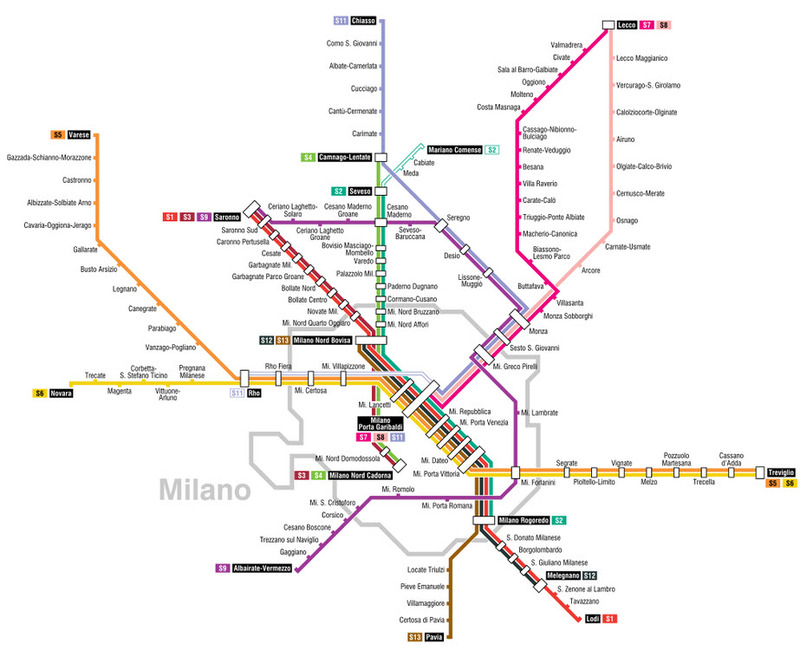 Map over the Milan suburban railway service, a commuter rail system serving the metropolitan area of Milan. You’ll find the Como S. Giovanni station on the lavendel blue line (S11) to the north, just before the end station Chiasso. On front of the passenger building, you will find a small parking lot with a sign displaying the telephone number for local taxis. The buses are operated by Società Pubblica Trasporti and buses are generally available between 07:20 and 22:15. The railway station was opened on 27 July 1875, as the Albate-Como section of the Milan Chiasso line was inagurated. The railway station was destroyed during World War II and the current building, designed by Paolo Perilli, was errected in the late 1940s and inagurated in 1949. In 2008, a €1 million renovation project was finished, which included not just general renovations and maintenance work but also changes that made the railway station more accessible by installing tactile paving for the vision impaired, construction of new lifts and the removal of architectural barriers.